14K gold buckle w/ two 1/4 karat diamonds via Clint Orms. $11600.00. Q: I recently picked up a silver Clint Orms "Trophy" buckle on vacation out west. In a room of Texan high-rollers you could call it understated, but I'm not sure how to pull it off in NYC without looking like a confused cowboy. Any suggestions? A: Charles, we applaud your decision to get a Clint Orms trophy buckle. 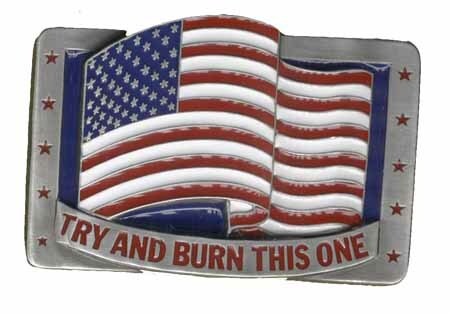 For those unfamiliar with Orms, he's a Texas-based silversmith and engraver known for his meticulously crafted belt buckles that along with silver incorporate gold, rubies, diamonds, sapphires, and emeralds. A single buckle may be constructed from as many as 200 different pieces, take 200 hours to make, and cost upwards of $20,000. Always remember, though, that while a belt buckle in it simplest form is functional, a belt buckle that costs more than $20 is essentially male jewelry, and male jewelry involving precious metals and stones is typically an express train to Toolbagville. So restraint is crucial. Orms clearly gets this -- even at their most ornate, his trophy buckles display a sense of lavish understatement (see example, pictured). The key to wearing them in NYC is to keep that principle in mind. First, we'd recommend going with a matte black/brown leather belt rather than lizard, alligator, or anything else with a lot of shine or texture. Second, keep everything else simple too: Unadulterated denim, canvas sneakers or sandals, and a well-worn tee or polo can work with an Orms trophy buckle. Never wear it with a suit. Never wear it with a shirt that has pearl snap buttons or Western-style stitching. Never wear it with a cowboy hat, a lariat, or cowboy boots -- which should be pretty easy since you should never wear a cowboy hat, a lariat, or cowboy boots in NYC anyhow. A: There is only one of those. We had it hand made by a young NYC artisan handy with pewter. This item has generated quite a bit of interest since that first site banner went live and might be worth putting into production. Stay tuned. 1. Beret. Violation of the principle of Anglophilia. Francophilia way less cool. 2. Multiple necklaces. Violation of principle of minimal accessorization. 3. Tucked-in sweater. Never do this. 4. Skull belt buckle. Skulls beyond outgoing. 5. Cane. OK if used for actual physical ailment; never OK for affect. Doesn't really work with skull belt buckle. Sioux belt buckle via Trading Post in Minoqcua, WI. $140.00. We killed most of them and stole their land, the least we can all do is buy their beautifully handcrafted trinkets. Unsnap those buttons, remove that "Try and Burn This One" buckle, and get in touch with the native in you, (even if there isn't one).